My first completed project of the new year is a purse. 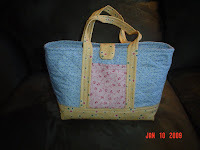 The pattern is called "The Convert-Able" by Tammy Tadd Designs and I made the purse through a class at my local quilt shop. 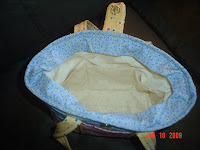 The pattern was not a hard one and I love the "insert" part of the pattern as I can make one insert and several "outsides" and then just place the insert into my second or third purse. There is a tab with a snap to close the purse. I also really like the fact that there are two pockets on the outside of the purse (one on each side) that are perfect for cell phone, keys, or whatever. The picture on the left shows the insert of the purse which hides underneath the blue interfacing. My insert has 6 pockets along the inside of the bottom. Hi, and welcome to my blog. I like to knit, sew, quilt, scrapbook, and read. I hope to share some of my creations, thoughts, and discoveries as the days progress. What do you need to trust God with?